Terror Aboard was recommended to me a little over three years ago in the comments section of my post about The Witching Hour (1933), another dark Paramount pre-Code release starring John Halliday. Kevin Deany wrote, “it’s almost like a precursor to a later slasher film, minus the gore.” I hunted down a copy right away and found Kevin’s description spot on: who would have thought that the often sleazy, though always debonair, John Halliday could ever carve out a place in my mind as a precursor to Jason Voorhees and other later screen madmen! Yes, Halliday plays the killer, and no, I don’t think that’s spoiling much, because much like the Friday the 13th franchise that Jason haunted throughout my formative years, Terror Aboard quickly becomes more about the killer’s variety of murder methods than who done it, or even who’s going to get it. Halliday remains debonair as Maximilian Kreig (how could he not?) and is a bit more methodical than modern day movie slashers—he even has a checklist—still, it’s a little surprising when he doesn’t just polish off all of his victims the same simple way he handled his first, with a quick and precise fatal gun shot wound. Above: Heading towards the Dulcina. “Maybe that’s the Flying Dutchman,” the unmistakable voice of Eddie “Rochester” Anderson croaks from the haze of my faded DVD copy of the film. It’s a bit part for Rochester, just another seaman on board Captain Swanson’s (Stanley Fields) City of Hope, which spots the out-of-control Dulcina in the near distance. When nobody answers their calls, Swanson and his men putter out towards the ghost ship with thoughts of a profitable salvage. There’s a lifeboat dangling from the side of the ship that one of Swanson’s men climbs to board and have a look around. 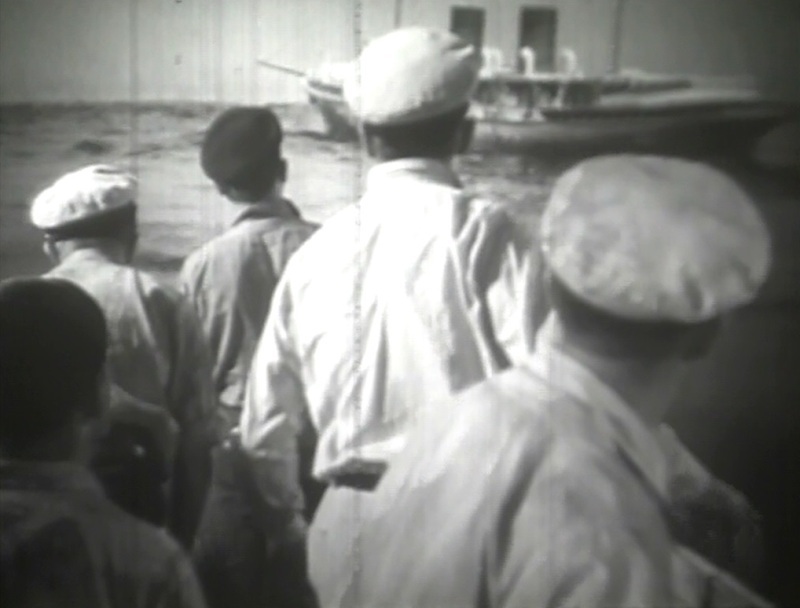 After a few minutes Swanson’s adventuring crewman does not answer, so the Captain and his men, including a doctor (Clarence Wilson), all board to investigate. Above: Stanley Fields and Clarence Wilson. Before they board a slim figure dressed in white is shown jumping off of the other side of the yacht. Swanson and his men discover their man face down on the ground, dead. “Hey, this is some kind of a devil ship,” Swanson growls. His men call out to him as other bodies are found: the frozen woman, her lover hanging. They’re ready to abandon ship after smoke begins billowing from the engine room, but on their way the doctor finds a torn portion of a radiogram that at least lays out a motive—addressed to Maximilian Kreig, it states that he’s been indicted by the grand jury for forgery and grand larceny. 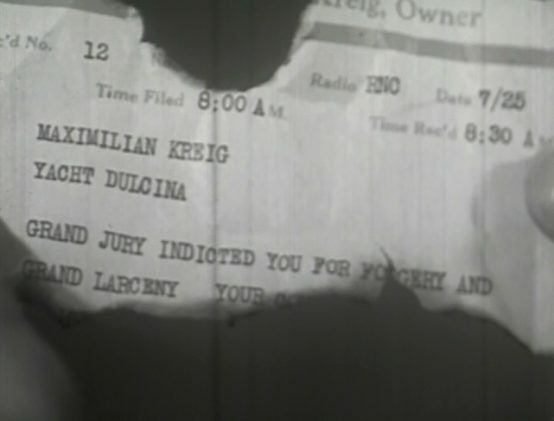 The burnt telegram that the doctor and Captain Swanson are looking at is then replaced on-screen by the undamaged, complete message, which adds “police will arrest you in any country. No possible chance for you to escape anywhere.” It’s just past the ten-minute mark of Terror Aboard, and we’ve entered a flashback which will unspool all of the devious happenings of the film over nearly an hour of additional action that eventually catches back up with the doctor and Captain Swanson where they stand. 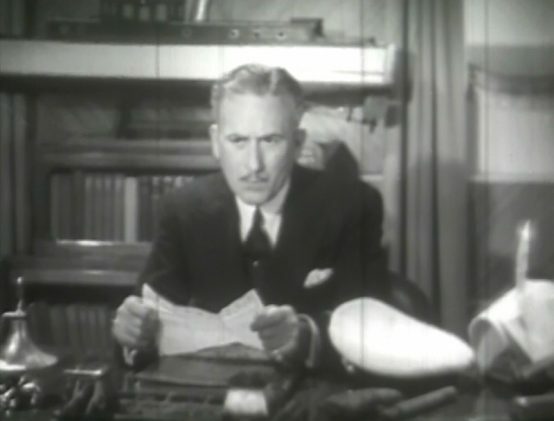 Above: John Halliday reads telegram. William Janney at his left. It’s Halliday’s Max Kreig holding the freshly received radiogram, providing all of the inspiration needed for the killing spree I previously described. His first kill comes in the communications room, no surprise, since young Wilson (William Janney) is the only other person on board the Dulcina who knows of Max’s bad news. What is a surprise is the graphic nature of Wilson’s death—he’s the gunshot wound, simple enough, but what begins as a small stain upon the breast of his jacket is shown leaking into a large dark splotch covering most of that half of Wilson’s upper body. It’s a believable though shocking and graphic murder. Then we get a bit crazy. “Overdone and misses,” said Film Daily, who at least found it “done with class and a good cast.” There's little surprise in the judgment of censor-friendly Harrison’s Reports, whose review opens: “Terrible! It should sicken even the most morbid follower of horror melodrama.” Given the source, that would only make me more curious about the film. These are industry reports though, they don’t tell us anything about what the run-of-the-mill movie patron thought of Terror Aboard. In that light, far more damning was the Hollywood Reporter who smeared it with the headline, “Audiences Amused Instead of Thrilled.” Ouch! They report that the audience was “effected” by the first couple of murders, “but after that, murder became a joke.” Ch-ch-ch-ah-ah-ah returns to mind as I recall guzzling beer while Jason stalks his next victim. 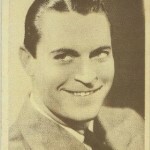 Above: Charlie Ruggles pictured on a slightly later promotional photo for No More Ladies (1935). Early Charlie Ruggles, especially pre-Code, grates on me. 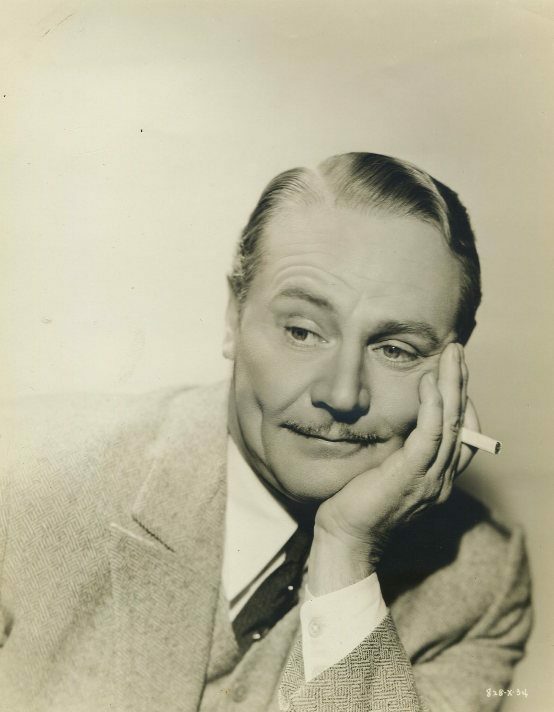 I don’t begin warming to him until about the time of his Egbert in Ruggles of Red Gap (1935), when his shtick is finally, if not toned down, at least smoother. My greatest grudge is probably caused because of the movie Ruggles did just before Terror Aboard, Murders in the Zoo (1933), which my mind almost divides into two separate movies just so I can continue to appreciate Lionel Atwill in one of his most horrific performances. I suspect the Ruggles of Terror Aboard would have been considered a low energy performance for him at this time, but for once I found myself chuckling at his every move. From his reaction to the cross-eyed sailor, to his repeated implications of the steward—in other words, himself—as the murderer, to his final bow of kissing a cat’s rear end, Ruggles’ low brow effort worked on me for a change. Above: Hard to see here, but you can probably make out the cat's eyes in the crook of Ruggles's arm. Speaking of Murders in the Zoo, how about the insane output of Paramount around this time? Murders in the Zoo released at the end of March 1933, then this one sailed along a couple of weeks later in mid-April, then Jack La Rue, who’s rather sedate in Terror Aboard despite playing big in two of its death scenes, popped up again much nastier in early May in The Story of Temple Drake. By this point the studio seems to have moved from sticking their tongue out at the censors to gleefully flipping them the bird. 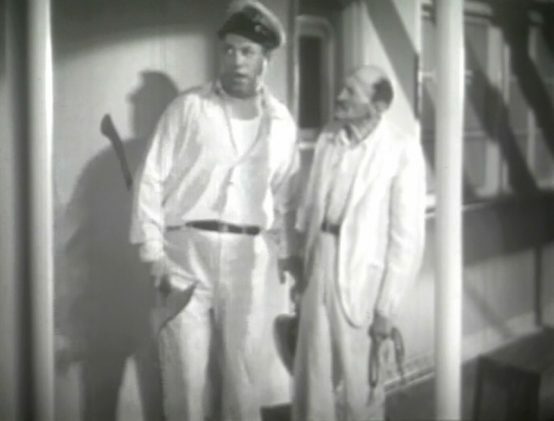 In addition to La Rue, other passengers riding out Terror Aboard are played by Verree Teasdale and Morgan Wallace, while Thomas E. Jackson is captain, and Leila Bennett is maid. Also on board is Shirley Grey, who has foolishly promised to marry the Halliday character once their ship reaches Australia. She tells Teasdale that she did it to make her ex jealous. By the time that ex arrives, mid-cruise, we’ve almost forgotten Neil Hamilton’s place in the credits. Halliday is effectively menacing as he greets Hamilton, his tone growing darker as he more fully recognizes the character as his competition for Grey. As Halliday’s kill spree mounts it’s always pretty obvious who’s going to manage to survive, so it’s nice of Terror Aboard to seed in a “Happily Ever After” for its leading lovers. 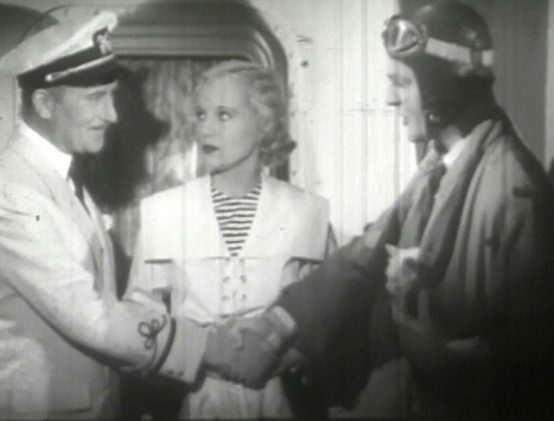 Above: John Halliday, Shirley Grey, and Neil Hamilton. A Los Angeles Herald Express clipping cited in the film’s AFI listing hints that Paramount likely planned Terror Aboard on a grander scale. 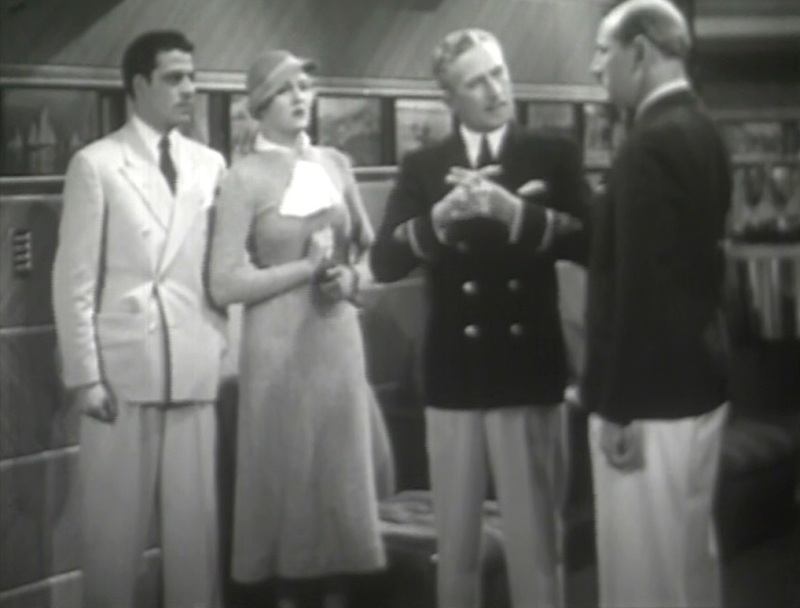 The Herald Express named Wynne Gibson, Richard Arlen, Cary Grant, Ricardo Cortez, Richard Bennett, Carole Lombard, and Sari Maritza as possible cast members. Variety confirmed Arlen, Gibson, and Grant in January, while Hollywood Reporter adds Lowell Sherman to the cast before the end of the month. Sherman had stopped acting to direct full-time by this point, but supposedly Paramount had tabbed him for the Halliday role. Halliday is first mentioned by Hollywood Reporter on January 28, with Lombard and Grant still set for the roles ultimately played by Shirley Grey and Neil Hamilton. Grant was sidelined from the project by a minor medical procedure, but was back soon to continue a busy year at Paramount. 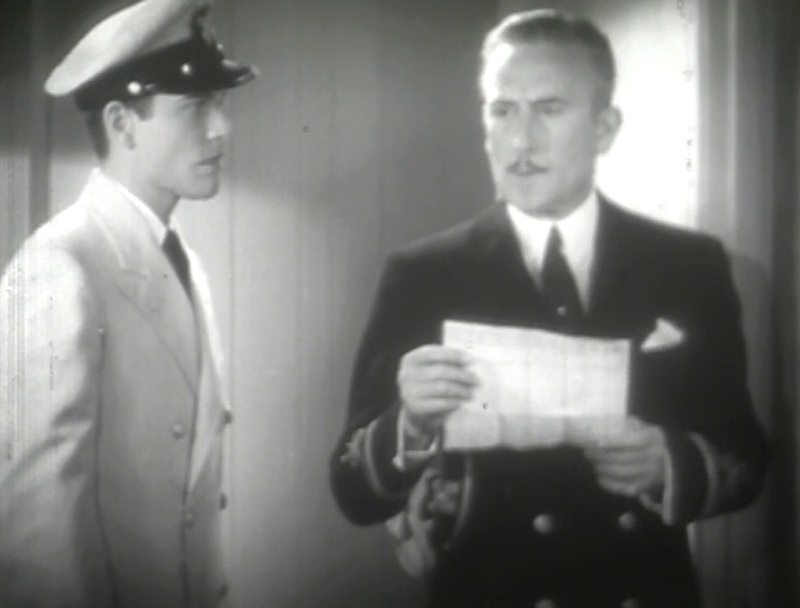 Lombard and Henry Stephenson asked out of Dead Reckoning because they didn’t think their parts were strong enough. Stephenson was replaced by Morgan Wallace. By February 15, Film Daily basically had the final cast in order for the film now titled Terror Aboard. Above, left to right: Jack La Rue, Verree Teasdale, John Halliday, and Morgan Wallace. You can imagine a little more care taken had Paramount stuck with the original cast and, probably, an overall better-crafted film emerging. 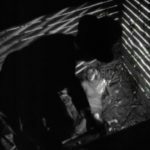 What we do have comes off as a bit rushed and a little sloppy, but I’ve yet to come across anything else out of the pre-Code era that is quite like Terror Aboard. Overall, Terror Aboard holds up better than any of its contemporary critics could have imagined. What it really could have used was a soundtrack, especially to accompany the murders. The framing device leading into the flashback is well-crafted and the murders, while becoming a bit much, offer some shocks, especially when taken from a historical perspective, which is what we’ve got. “Carole Lombard Set.” Hollywood Reporter. January 28, 1933, 1. “Grant in Hospital.” Hollywood Reporter. February 6, 1933, 2. “Lombard-Stephenson Out of ‘Dead Reckoning.’” Hollywood Reporter. February 4, 1933, 4. “Review: Terror Aboard.” Film Daily. July 3, 1933, 3. “Studio Placements.” Variety. January 17, 1933, 12. “‘Terror Aboard,’ Designed as Tragedy, Is Serio-Comic.” Hollywood Reporter. March 22, 1933, 5. ““Terror Aboard’ with John Halliday and Charlie Ruggles.” Harrison’s Reports. April 15, 1933, 58. “‘U’ Wants Sherrman to Direct 'Half-Way Girl.” Hollywood Reporter. January 23, 1933, 3. Wilk, Ralph. “A Little from Lots.” Film Daily. February 11, 1933, 4. Wilk, Ralph. “A Little from Lots.” Film Daily. February 15, 1933, 6. 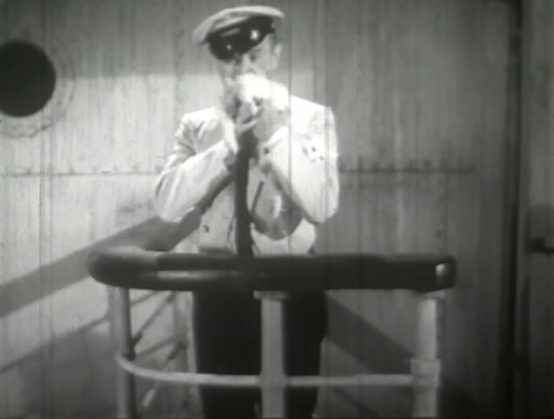 Terror Aboard (1933). Paramount Pictures. 69 minutes. Directed by Paul Sloane. Story by Robert Presnell Sr. with Manuel Seff and Harvey Thew. Working title: Dead Reckoning. Starring John Halliday, Charles Ruggles, Shirley Grey, Neil Hamilton, Jack La Rue, Verree Teasdale, Stanley Fields, Leila Bennett, Morgan Wallace, Thomas (E.) Jackson, William Janney, Paul Hurst, Frank Hagney, Clarence Wilson, Paul Porcasi, Bobby Dunn, Kit Guard, and Peter Hancock.